AUSTIN, Texas – Religious leaders from all over Texas rallied for gender equality on the north steps of the Texas Capitol on Feb. 17. The Unitarians seemed to have the most signs, but many others, including Baptists, Methodists, and Episcopalians were also represented, according to Equality Texas organizer Daniel Williams. He also said that marriage equality has union support, particularly from the Communications Workers, in the state. The procession of ministers who spoke were strongly and completely behind the federal judge who ruled, that same day, that Texas’ ban on same-gender marriage was unconstitutional. 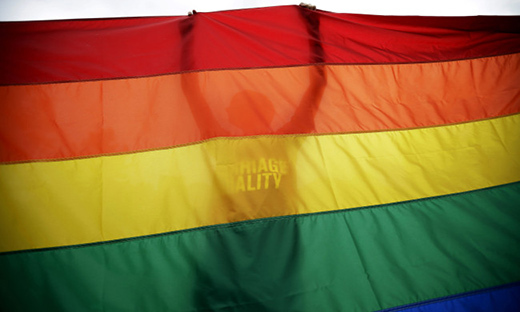 Texas can be counted as one in a long line of states with unconstitutional homophobic laws. Unfortunately, Austin’s county probate judge refused to begin issuing marriage licenses to gay couples until further appeals are settled. The crowd of about 100 was enthusiastic. They didn’t just come to rally and to sing, they also spent the day inside the Capitol to lobby their legislators.